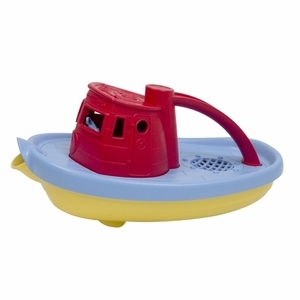 Set kids on a course for fun and let them sail the high seas-or at least navigate the bathtub and wading pool-with this Tugboat toy. There's no end to the fun young sailors can have with this colorful craft that floats great and has a wide spout to scoop and pour water. Made in the USA from recycled plastic milk containers to save energy and reduce greenhouse gas emissions, our trusty Tugboat is both good for the Earth, and (most importantly) safe for the busy little folks who play there: It's free of BPA, PVC, phthalates and external coatings.